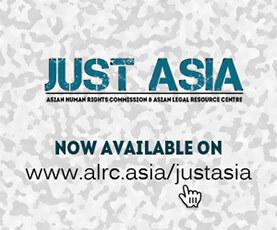 The Asian Legal Resource Centre (ALRC) wishes to raise grave concerns with the Human Rights Council about ongoing impunity in the case of the disappearance of Somchai Neelaphaijit in Thailand. On 12 March 2014, the tenth anniversary of Somchai’s disappearance will pass without the perpetrators being held to account. During the past ten years, the Government of Thailand has obstructed the investigation and judicial processes, at times actively and at times through inaction. The ongoing failure to hold the perpetrators responsible has resulted in both a failure to secure justice for Somchai Neelaphaijit as well as the further consolidation of a broad culture of impunity for state violence and violations of human rights in Thailand. Somchai Neelaphaijit was a noted lawyer and human rights defender. At the time of his enforced disappearance, Somchai was working on behalf of five men who had alleged that they were tortured by state security officials while they were in state custody in Narathiwat, one of the three southern-most Thai provinces, which has been under martial law since January 2004 and under emergency regulations since July 2005. On 11 March 2004, the day before his enforced disappearance, Somchai submitted a complaint to the National Human Rights Commission, the Royal Thai Police, and the Senate which detailed the forms of torture experienced by the five men. He argued that this was both a violation of their rights and the Criminal Code, which prohibits torture. He also spoke out publicly and passionately on the case, accusing the police of gross wrongdoing. On 12 March 2004, one day after he submitted complaint, five policemen pulled Somchai Neelaphaijit from his car on a main road in Bangkok. He has not been seen since then. The very form of the crime of enforced disappearance often makes redress particularly difficult. In the case of the disappearance of Somchai Neelaphaijit, at every stage of the investigation, there was obfuscation by police officers, a lack of will by many inside the state (including at the highest level of the then-prime minister, Thaksin Shinawatra) to cooperate, and mishandling of evidence. After a labyrinthine legal case and courageous struggle by his wife, Angkhana Neelaphaijit, his children, and many human rights activists, the five police officers who pulled him from his car ten years ago have no charges outstanding against them. Four of them are known to be living outside prison. Uncertainty surrounds the whereabouts of Police Major Ngern Thongsuk, the only one of the five to be convicted (of coercion) by the Court of First Instance on January 12, 2006. He was immediately granted bail for the term of the appeal. Under conditions which remain unclear, he allegedly disappeared following a mudslide in September 2008. On March 11, 2011, the conviction of Police Major Ngern Thongsuk was overturned and the judgment of innocence of the four other involved police officers was upheld by the Appeal Court. In particular, the lack of the category of disappearance as a crime within Thai criminal law has created a series of obstacles at each stage of the judicial process. At this time, the Court of First Instance and the Appeal Court have made rulings in the case, and it is currently under examination by the Supreme Court. Under evidentiary rules in the Thai Criminal Procedure Code, without a body – which could never be located – a murder charge cannot be levied. Therefore, the involved police officers were charged and prosecuted for theft (of Somchai’s vehicle) and coercion. Only one police officer out of five was found guilty by the Court of First Instance in January 2006. However, additional evidentiary problems led to his acquittal by the Appeal Court in March 2011. In addition, in their ruling in this case, the Appeal Court dispossessed the rights of victims and families to seek accountability. In the case against the perpetrators, Angkhana Neelaphaijit and her children were joint plaintiffs with the public prosecutor. Under the Criminal Procedure Code, families can act on behalf of injured or dead person. The Appeal Court ruled that in this case, there was not sufficient proof that Somchai Neelaphaijit was dead, and therefore his family could not act on his behalf. In other words, the lack of the category of enforced disappearance within Thai law has made it incredibly difficult to hold the perpetrators accountable for their crimes. At present, the case is being examined by the Supreme Court. The Department of Special Investigation (DSI), a special elite government investigation unit, is the one responsible for the case of the disappearance of Somchai Neelaphaijit. The DSI has often seemed to actively obstruct the struggle for justice in this case. This has included the mishandling of evidence, a lack of interest in pursuing the investigation, and the failure to provide proper witness protection to Angkhana Neelaphaijit, Somchai’s wife. In late 2013 and early 2014, the DWI engaged in a series of actions which suggested that there is an intensified lack of will inside the state to continue the search for justice in this case. The first of these actions was a bizarre announcement by the DSI that the case file had been stolen, and then its speedy recovery. In December 2013, Niran Adulayasak, Director of DSI Special Criminal Case Office 1 made a statement in a news report on Thai PBS television that when members of the protests by the anti-government People’s Democratic Reform Council broke into his building, they went to the cabinet containing the file of Somchai’s case and removed it from the premises. Several days later, following criticism by the AHRC, Human Rights Watch, and other human rights advocates, Niran made a second statement in a news report on Thai PBS television that the file had been found in a corner of a steel cabinet. During the same second news report, Niran announced that he planned to consult the prosecutor of special litigation to terminate investigation into the disappearance of Somchai Neelaphaijit in January 2014. At present, there has been no announcement from Niran himself, the DSI, or the Government of Thailand regarding whether or not the investigation will continue. A decision to end the investigation will result not only in yet another obstacle to justice in this case, but will make it impossible. Over two years ago, on 9 January 2012, the Thai Government signed the UN International Convention for the Protection of All Persons from Enforced Disappearance. To date, the convention has not been ratified nor has domestic law making disappearance a distinct crime moved forward in Thailand. The lack of a formal legal and investigatory framework accounting for disappearance in Thailand is part of what has caused the series of difficulties in the court case regarding Somchai Neelaphaijit’s disappearance and what makes it possible for the DSI to arbitrarily announce that they plan to halt the investigation into his disappearance. The Asian Legal Resource Centre is aware that ratification of the Convention will entail significant changes to both national law and the routine practices of law enforcement and the judiciary. However, these changes are necessary in order to combat impunity in the cases of the disappearance of Somchai Neelaphaijit, and in the cases of 59 other persons disappeared between 2001 and 2012 documented by the Justice for Peace Foundation. Article 3 of the Convention mandates that, “Each State Party shall take appropriate measures to investigate acts defined in article 2 committed by persons or groups of persons acting without the authorization, support or acquiescence of the State and to bring those responsible to justice.” It is clear that under the Convention, rather than curtailing the investigation into Somchai Neelaphaijit’s disappearance, the DSI and other relevant agencies should recommit themselves to securing the truth and justice. Article 4 of the Convention mandates that, “Each State Party shall take the necessary measures to ensure that enforced disappearance constitutes an offence under its criminal law.” Either the amendment of the Thai Criminal Code or the passage of a separate law providing for the category of enforced disappearance is essential in order to facilitate the full criminal and judicial investigation can be carried out in cases of disappearance and to ensure that the relatives of victims are not dispossessed of their right to seek justice for their loved ones. Article 5 of the Convention mandates that, “The widespread or systematic practice of enforced disappearance constitutes a crime against humanity as defined in applicable international law and shall attract the consequences provided for under such applicable international law.” Given the significant number of disappearances documented in Thailand, and which may only represent a fraction of the total number of disappearances, the Government of Thailand should be mindful of the gravity of the crime. As the Government of Thailand has not ratified the Convention, they are not legally bound to adhere to these articles. However, the delay in ratification should not be taken as permission to flagrantly disregard the spirit and proscriptions of the Convention. Request that the Working Group on Enforced or Involuntary Disappearances continue to monitor the case of Somchai Neelaphaijit and other cases of disappearance in Thailand.